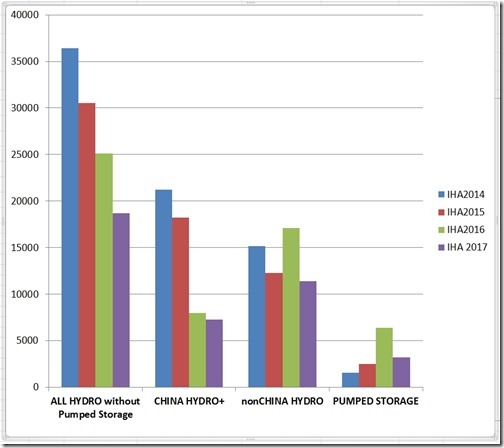 The 2018 Hydropower Status Report offers insights and trends on the hydropower sector from members of International Hydropower Association..
A record 4,185 terawatt hours (TWh) in electricity was generated from hydropower in 2017. 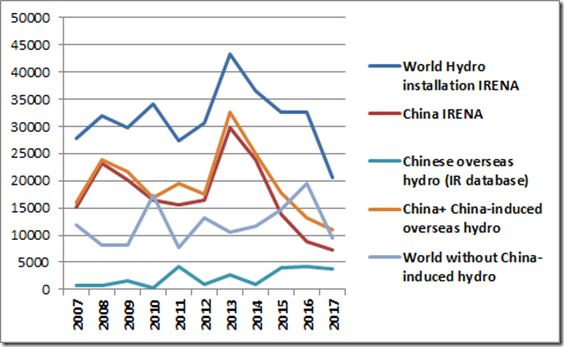 Growth was fastest in East Asia and the Pacific, with 9.8 GW of capacity added in 2017(9.1 GW in China), followed by South America (4.1 GW), South and Central Asia (3.3 GW), Europe (2.3 GW, half of that pumped storage), Africa (1.9 GW) and North and Central America (0.5 GW). 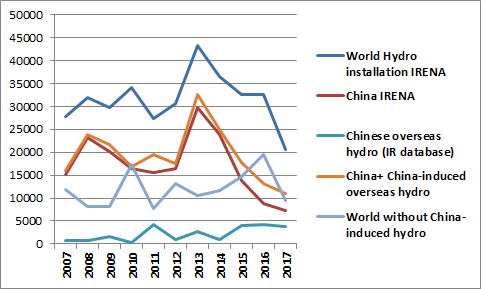 China is the world’s largest producer of hydropower, and accounted for nearly half of global added installed capacity, at 9.1 GW. It was followed by Brazil (3.4 GW- in December 2017 this country decided to discontinue large projects in Amazonia and IHA notes that ), India (1.9 GW), Portugal (1.1 GW of pumped storage) and Angola (1.0 GW). 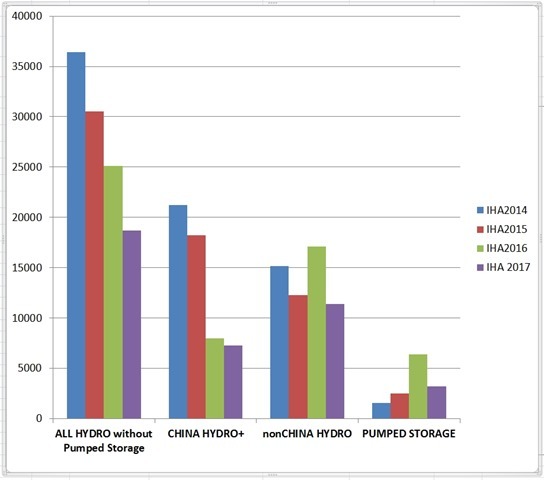 Despite obvious trend in the industry the IHA claims that 58.4 per cent of surveyed hydropower decision-makers and professionals expect to expand their company’s installed capacity in the next three years, while 51.7 per cent of respondents expect to increase investments in hydropower over the next three years. ( About such unreasonable behavior Russians say “they have wind in their heads” – we wish it was the case with those energy companies, which still “have water in their heads”). The 2018 IHA Report is ethically very questionable. For example, one of its four(!) forewords is attributed to a high official from Ethiopia with Gibe IIII Dam portrait presented as illustration. Because of detrimental effects of this dam and Ethiopia’s unwillingness to develop mitigation measures the World Heritage Center proposed to inscribe Lake Turkana National Parks (Kenya) on the List of World Heritage in Danger. Decision will be taken by the World Heritage Committee session in Bahrain in June 2018. It is also symbolic that the IHA lists among this Report collaborators representatives from the EPM – Empresas Públicas de Medellín – a company that in May 2018 put at risk 120000 Colombians as its 2.4GW HidroItuango dam under construction was about to collapse due to engineering mistakes and negligence. As of May 24, date of the IHA report release, 26000 people were evacuated from Cauca River Valley and many suffer without shelter and food, construction workers managed to raise the dam wall over spillway reducing risk of immediate collapse, machine chamber was flooded and equipments likely damaged, several rating agencies have already downgraded EPM company, which also faces corruption and negligence charges from Colombian prosecutors. Ríos Vivos Colombia Movement which represents local dam victims issued global pledge for donations to support emergency efforts.